National and international laws have been enacted and numerous international human rights instruments, particularly a treaty to ban racial discrimination, have been adopted. Yet, the dream of a world free of racial hatred and bias remains a faraway ideal. Here you will find in-depth reviews, interviews, infographics and racism stories from around the globe. 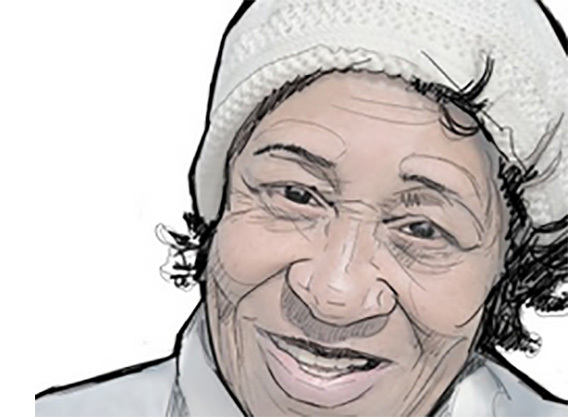 This dossier will be constantly updated with the newest statistics about racism, events and projects against racism. The nature of racism changes across times and contexts. Social change takes time; sometimes a generation, sometimes more, given the need for structural change. But it all starts with civil courage and education. From the nation’s harsh immigration policy – which its Prime Minister has attempted to export to the EU – to the proposed closure of indigenous communities, 2015 has not been a good year for Australia’s human rights reputation. The face of this shame is Australian Prime Minister Tony Abbott, who has become an easy target for comedy, with the satirical current affairs show Last Week Tonight with John Oliver making popular segments that mock the world leader. Oliver himself has described Abbott as "a car crash of a human being", his flaws ripe for comedy. The Prime Minister has certainly become an easy target. The man who won’t approve gay marriage despite having a lesbian sister, and enforces the harshest border policy in the world despite being a migrant himself is not looked upon kindly by international media. So what kind of population is he leading? A 2013 report from the University of Western Sydney titled Challenging Racism found that 87% of Australians believe in the benefits of cultural and racial diversity. From the repealing of the While Australia legislation to the enactment of the Racial Discrimination Act passed in 1975, the lucky country has come a long way. The Mapping Social Cohesion report from the same year showed that Australians overwhelmingly see themselves as “kind, caring and friendly”. So why do foreign perceptions negate this? On BBC News: Australian Football League (AFL) star Adam Goodes says he is taking time off, as a row over racism in the game shows no sign of dying down. That’s right, enough people have asked Google this question that it is now the question Google suggests first. 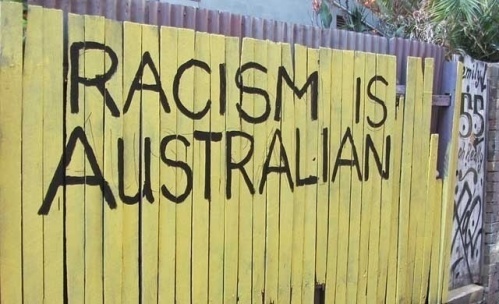 We are all, of course, poor at judging ourselves, but it seems there are plenty of other people keen on finding out exactly how Australia has earned its reputation for racism, one that sits so sharply in contrast of how Australian nationals see themselves. Indigenous Australians have faced a long history of oppression at the hands of colonisation, from the Rabbit-Proof Fence to stolen generations, poorer quality of life and life expectancy, to lack of representation. This year the struggle of Indigenous Australians played out on the world stage as protests took place around the globe against the proposed closure of rural Aboriginal communities. The closures would result from the cutting-off of basic services in a bid to save costs. But it would also force indigenous people off their ancestral land, to which they hold a sacred connection. After Tony Abbott said that Australian taxpayers should not have to subsidise the Aboriginal “lifestyle choice”, human rights activists, as well as ordinary Australians, took to the streets in protest. The issue remains unresolved. Another indigenous issue currently playing out in the popular discourse is the display of Aboriginal culture during Australian Football League (AFL) matches. Prominent indigenous AFL player and former Australian of the Year Adam Goodes has been consistently booed during his play in this year’s matches, following an incident where a 13-year-old crowd member called him an ape and he called her out for the racial slur. She was removed from the stadium and, although he refused to press charges, Goodes has been criticised for calling out such a young fan. Since then, Goodes has been vocal about indigenous rights and the need for them to be supported by the sports league. But this season, every time Goodes gets the ball during game-play, boos are heard throughout the crowd, no matter which part of Australia the match is taking place in. At the end of July, the debate gained new momentum as another indigenous player, Lewis Jetta, performed a spear-throwing dance in response to the crowd’s hounding of Goodes. He told media he had done this in support of his teammate and their shared cultural cause. But many took offense, saying the performance was threatening – although Jetta was throwing an imaginary spear. This led supporters to ask: does an imaginary spear pose a greater threat than racism? Meanwhile, Goodes continues to suffer abuse in his very public workplace – a fellow sportsman has even suggested he be deported, despite the 40,000 years his people have lived on Australian soil. Deported back to where, exactly? Indigenous affairs are not the only racial issue in Australia. Ironically, while the Abbott administration fights a native fire in one direction, it also fights a foreign one on the other side. 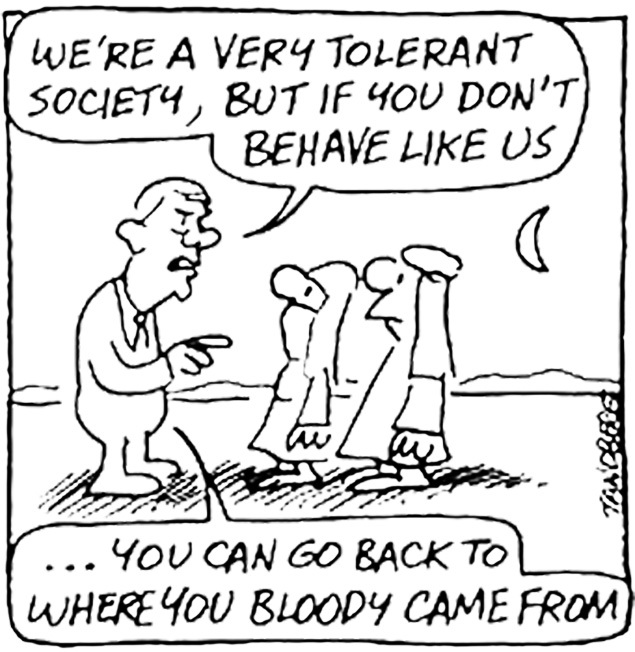 If it’s not indigenous people or foreigners, then who really is welcome in Australia? Australia’s Stop the Boats policy is among the harshest in the world, promising that no person seeking asylum in Australia who arrives by boat will ever be resettled there. It’s the policy Abbott was elected on in 2013. Not allowing asylum seekers to claim asylum is in breach of international laws, and yet Australia continues to shift responsibility, making deals with poorer nearby nations to detain the asylum seekers on behalf on Australia for indefinite periods of time. Fear-mongering pervades the media landscape, describing asylum seekers as a burden that Australia needs to rid itself of. Claims of child abuse in detention centres abound, while doctors treating asylum seekers are threatened with jail time if they report abuse. Press are prevented from reporting from the detention centres, and in Nauru, where many asylum seekers are being held, Facebook was recently shut down – the channel these people had been using to report on their own living conditions. The reports of abuse, maltreatment and neglect are pervasive and threaten to permanently tarnish Australia’s international standing. Sometimes, though, there is hope in a hashtag. Last December a man took 18 people hostage in a Sydney café, and demanded that an ISIS flag be delivered to him, aligning himself to the extremist terrorist movement. During the crisis, some Australians expressed concern that this could force an increase in violence and intimidation towards Muslims in Australia, disconnected as they are with ISIS. One woman wrote on social media that she had removed her head covering, hoping to more easily blend in with the public on her commute home from work. This sparked the use of the #illridewithyou hashtag. People would tweet their public transport route with the hashtag, thereby offering to ride with anyone who felt threatened. This display of solidarity on a dark day for Australia gives hope that there is room for change in the lucky country. As much as we can say Australian policy is racist, it’s the individuals that make up a culture and drive social change. As Jermain Raffington, a black professional basketball player, grew up in Germany, he lacked role models with whom he could identify. 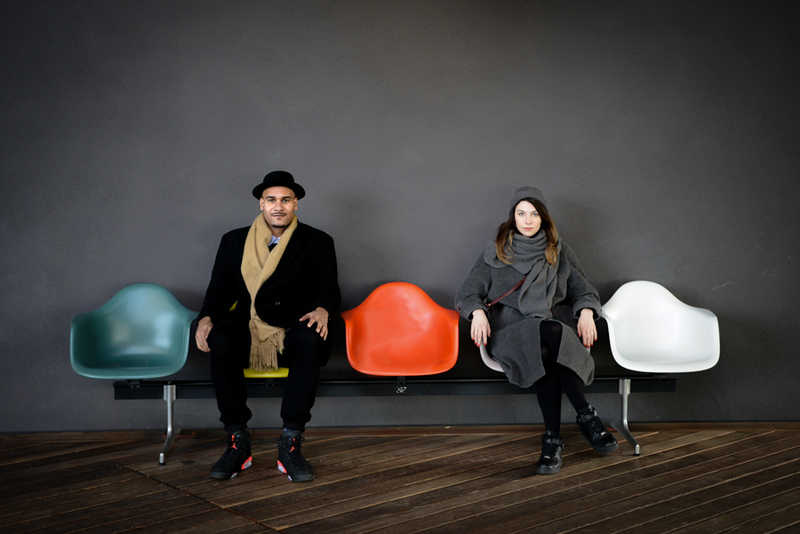 Therefore Jermain and his wife Laurel started the project "Schwarz-Rot-Gold" and embarked on a journey to find these role models, for their own children and for all other people that are black Germany to feel inspired to pursue their goals. Since June 2009 SYLVIE NANTCHA is the first African-German councilor of the conservative party CDU in Freiburg. From 2009 to 2013, she was the first Afro-German CDU regional board member in Baden-Wurttemberg and in Germany. MARIE NEJAR is a Franco-German singer and actress. She played as black extra in UFA movies during the time of National Socialism. After the end of her career she got an education as a nurse. In this profession, she worked until her retirement. Video soon available! South Africa experienced a spate of brutal and horrific xenophobic violence against foreign nationals in April 2015. The attacks broke out in the Isipingo and Kwa Mashu townships in Durban before spreading to the volatile townships of Primrose and Alexandria in Johannesburg. The violence mostly affected nationals from Zimbabwe, Mozambique, Malawi, Zambia, Nigeria, Somalia and Ethiopia who had fled the political and economic crises in their home countries. In what seemed like the scenes of a horror movie, the violent mob searched for foreigners in the high density slum residences and in the central business district of Durban. They lit up many of the shacks belonging to foreigners. Those foreigners that were captured were subjected to horrific beatings which led to several deaths and left many injured. Although the actual number of the foreigners that died remains unknown, the authorities have relied on the police figures which claim that only eight people died. Many of the accounts from victims and eye witnesses suggest that a larger number of casualties are highly probable. Tinevimbo Shoko, a Zimbabwean who resided in the Kwa Mashu township when the violence broke out believes that more than eight people met their deaths during this tragic period. “A lot of people died in the shacks in Isipingo and Kwa Mashu townships here in Durban,” lamented Shoko. Other eye witnesses maintain that a greater number of people than that which was reported was both shot and hacked to death in Pinetown and other surrounding areas. “A lot of people were struck with machetes and knives. More than ten people were shot by the attackers in Pinetown. Those who were lucky managed to be rushed to hospitals and survived,” said Sikhumbuzo Sigola, a Zimbabwean immigrant living in Isipingo, Durban. “The attackers came into the area and asked if any foreigners lived in our compound. They commanded all the locals (South Africans) to leave so that they could ‘fix’ us for being in their country. They thrashed a lot of people and burnt our dwellings,” narrated a traumatised Shoko. In interviews with Fairplanet, the victims claimed that a lot of people were killed and tortured but that their cases had not been recorded by the police and the media. The xenophobic perpetrators even unleashed their terror on fellow South Africans who harboured foreign nationals in their compounds. “The attackers warned us against hiding the foreigners in our houses," related a distraught Duduzile Mkize, a South African national residing in the most volatile township of Kwa Mashu in Durban, South Africa. “Those who dared protect their foreign relatives and friends were beaten and had their dwelling shacks (most poor South African urban dwellers reside in plastic shacks where the violence was more widespread) burnt by the mobs,” explained Mkize. “We did not sleep at home for more than two weeks, we were afraid the attackers would kill us since I worked for a Malawian family. My children did not go school and for our safety we went to our rural home,” Mkize further recounted her ordeal. The xenophobic attacks sent shivers down the spines of even those that were in South Africa legally such as tertiary students. A Zimbabwean tertiary student studying in Durban, Gugulethu Mlilo* (Not her real name) said the situation was so bad that even students feared for their lives. Many of the survivors of the attacks cannot go back to their former settlements as they fear for their lives and have since been accommodated in different places on the farms surrounding Durban and Johannesburg. 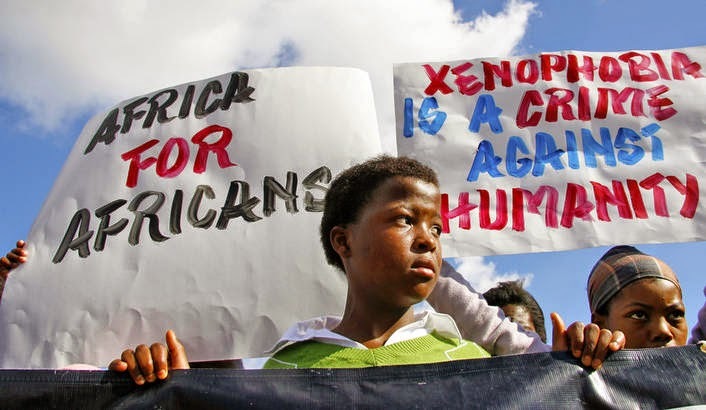 South Africa has witnessed a number of xenophobic attacks since 2008. Xenophobia is a fear of or hatred for foreigners. The recent attacks have led to a canny nicknaming of the phenomena within the context of South Africa as ‘Afrophobia’, that is the fear of and hatred for Africans not of South African origin. The locals blame foreigners for taking away their jobs and women as well as for the high youth unemployment and widespread criminal activities. The recent bout of xenophobic violence that broke out in the Kwazulu-Natal province of South Africa has been linked to the utterances by the influential and well-respected Zulu king Goodwill Zwelithini. While addressing his followers in Kwazulu-Natal, the king told foreigners to go back to their countries. “When foreigners look at them (South Africans) they will say let us exploit the nation of idiots. As I speak, you find their unsightly goods hanging all over shops, they dirty our streets. We cannot even recognise which shop is which, there are foreigners everywhere.... As king of the Zulu nation...I will not keep quiet when our country is led by people who have no opinion. It is time to say something. We ask foreign nationals to pack their belongings and go back to their countries”, said the Zulu king Goodwill Zwelithini to the applause of his audience. “I know it is hard for other politicians to challenge this, because they are after their votes. Please forgive me but this is my responsibility, I must talk, I cannot wait for five years to say this,” he added. between South Africa and Nigeria erupted again with the former recalling their ambassador in protest. The President of Zimbabwe, Robert Mugabe, who is also the chairman of the African Union (AU) and the Southern African Development Community (SADC) described the attacks on foreigners as shocking and disgusting. "I want to express our sense of shock and disgust ... The act of treating other Africans in that horrible way can never be condoned by anyone," said Mugabe while addressing scores of people at Zimbabwe’s heroes acre during the country’s independence celebrations. "And whether these are followers of the Zulu king Zwelithini or the followers of some other misled members of the South African community ... that must never happen again, never happen again in South Africa or any other country," rebuked Mugabe. The South African minister of home affairs, Malusi Gigaba, was reported in the South African Mail and Guardian as acknowledging that the xenophobic attacks had created a rift between South Africa and her neighbours across the African continent and beyond. "The international community must not view South Africa as a xenophobic and Afro-phobic country.... And Africa in particular must not think that we hate fellow Africans so much that we are prepared to do the worst to cause them harm. We are taking steps to address this," said Gigaba. The Geography of Hate is part of a larger project by Dr. Monica Stephens of Humboldt State University (HSU) identifying the geographic origins of online hate speech. Undergraduate students Amelia Egle, Matthew Eiben and Miles Ross, worked to produce the data and this map as part of Dr. Stephens' Advanced Cartography course at Humboldt State University. The data behind this map is based on every geocoded tweet in the United States from June 2012 to April 2013 containing one of the 'hate words'. This equated to over 150,000 tweets and was drawn from the DOLLY project based at the University of Kentucky. Because algorithmic sentiment analysis would automatically classify any tweet containing 'hate words' as "negative," this project relied upon the HSU students to read the entirety of each tweet and classify it as positive, neutral or negative based on a predefined rubric. Only those tweets that were identified by human readers as negative were used in this analysis. To produce the map all tweets containing each 'hate word' were aggregated to the county level and normalized by the total twitter traffic in each county. Counties were reduced to their centroids and assigned a weight derived from this normalization process. This was used to generate a heat map that demonstrates the variability in the frequency of hateful tweets relative to all tweets over space. Where there is a larger proportion of negative tweets referencing a particular 'hate word' the region appears red on the map, where the proportion is moderate, the word was used less (although still more than the national average) and appears a pale blue on the map. Areas without shading indicate places that have a lower proportion of negative tweets relative to the national average. The numbers that appear in the map during a mouse hover indicate the total number of hateful tweets and number of unique users sending them in each county. Text by floatingsheep. Read more about the research and methods behind this project at www.FloatingSheep.org. During the year 2013, racist groups conducted at least 360 demonstrations in the country, which they chanted hideous racist slogans including the calls for massacre and forced repatriation of minorities. Racist groups have been spreading their messages both nationally and internationally through disseminating the video recordings of demonstrations among the internet. Although some members of racist groups have faced criminal prosecution for their misconducts, no case was ruled by court as an act of racial discrimination. Moreover, no public officials and politicians, who made discriminatory remarks against minorities, have been sanctioned properly. Systematic discrimination against minorities can increase the risk of targeted violence and atrocity crimes. Ethnic Koreans, who have resided in Japan for generations since the colonial period, have suffered from structural discrimination such as the denial of the right to vote and the restrictions on access to public service jobs. 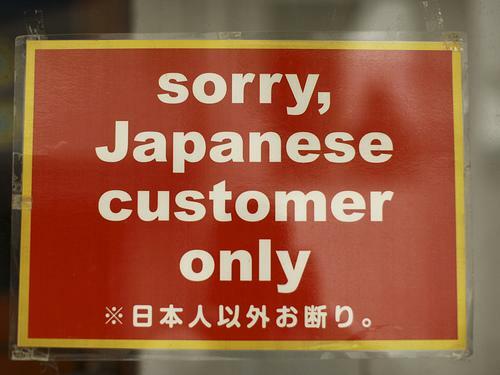 Regrettably, the Government of Japan has strengthened institutionalised discrimination against ethnic Koreans. In February 2010, the Government purposely excluded Korean schools from its new programme to make the high school education free of charge (“tuition waiver programme”). The right to education of ethnic Korean children to learn own language, history and traditional culture has been denied by the Government. Racist groups and individuals interpreted such attitude of the Government as an official justification of the discrimination against ethnic Koreans. To prevent violence and atrocity crimes against minorities, the adoption of comprehensive and specific legislation prohibiting discrimination on the grounds of national or ethnic origin, colour, language, religion as well as descent is essential. Anti-hate speech legislation should be designed to protect human rights of minorities and punish perpetrators in accordance with the international human rights law. London Street and Fine Artist Ben Slow's unique style of mixing Fine Art with urban surroundings illustrate his passion for finding meaning in his work, spreading a message, telling stories. That is why he joined forces with "Stand Up to Racism" campaigners Rashida Islam and Barbara Ntumy to raise the profile of this year's UN International Day for the Elimination of Racial Discrimination, by attempting to paint as many walls as possible with Anti-Racist art work. To make this happen a crowdfunding-campaign was initiated. With £ 1000 for materials and support for the demonstration on March 21st "Street Art Stands Up to Racism" aims to get the project from London to Paris and New York. Support this outstandingly creative project, which represents a street art credo by uniting urban art and political activism and help them to stand up to racism. The International Day for the Elimination of Racial Discrimination, is announced annually on March 21st. On that day, in 1960, police opened fire and killed 69 people at a peaceful demonstration in Sharpeville, South Africa, against the apartheid pass laws. Proclaiming the day in 1966, the United Nations General Assembly called on the international community to redouble its efforts to eliminate all forms of racial discrimination! Every year, March 21st marks “The International Day for the Elimination of Racial Discrimination”. In a joint initiative FAIRPLANET.org has teamed up with Tel Aviv-based SUAN.fm (Stayed Up All Night) to create the world’s longest crowdsourced mixtape in 2015. 602 people from 42 countries contributed 530 songs to give an universal statement against racism and discrimination. Click suan.fm/noracism to listen to the mixtape and check out the global Facebook event and Twitter #MixtapeAgainstRacism! The concept of race was originally a product of the natural sciences, which attempted to scientifically underpin the dominant European cliché of a superior white race in the 19th century. The origin of racism goes back to the colonization of Africa and South America. The enslavement of millions of Africans to exploit the resources of the conquered territories solidified the European’s pretension of a moral and civilizational superiority of the "white race". During the past 500-1000 years, racism on the part of Western powers toward non-Westerners has had a far more significant impact on history than any other form of racism (such as racism among Western groups or among Easterners, such as Asians, Africans, and others). The most notorious example of racism by the West has been slavery, particularly the enslavement of Africans in the so-called "New World" (slavery itself dates back thousands of years). In the early 20th century, the "ethnographic World Maps" of German and French atlases showed a connection between the continents and the "races", who alleged lived there. According to these maps the human kind consists of races or populations which differ in certain hereditary characteristics from each other, and the most striking of which is the color of their skin. In fact, contemporary scientists are not in agreement on whether race is a valid way to classify people. What may seem to be significant "racial" differences to some people - skin color, hair, facial shape - are not of much scientific significance. In fact, genetic differences within a so-called race may be greater than those between races. "Racism has always been both an instrument of discrimination and a tool of exploitation. But it manifests itself as a cultural phenomenon, susceptible to cultural solutions, such as multicultural education and the promotion of ethnic identities. Tackling the problem of cultural inequality, however, does not by itself redress the problem of economic inequality. Racism is conditioned by economic imperatives, but negotiated through culture: religion, literature, art, science and the media. ... Once, they demonised the blacks to justify slavery. Then they demonised the “coloureds” to justify colonialism. Today, they demonise asylum seekers to justify the ways of globalism. And, in the age of the media, of spin, demonisation sets out the parameters of popular culture within which such exclusion finds its own rationale — usually under the guise of xenophobia, the fear of strangers."